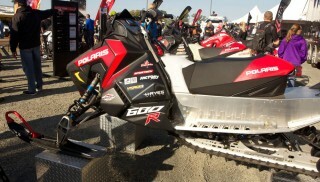 Arctic Cat has unveiled its 2016 Snocross and Cross Country race sleds at Minnesota’s Hay Days event. Arctic Cat’s cross country racer, the ZR 6000 X XC, features a host of updates for 2016, but none more notable than the new Team Rapid Response drive clutch. Other updates include revised driven belt tensioner bolt, Borg Warren chain and sprockets, revised chain case mounting and fasteners, new brake pad material (T-124), new rail and additional mounting holes for front arm shock (for ice racing), new style retaining nuts in rear suspension, revise rear shock valving for more rebound control, new lightweight torque-sensing link arm, Cobra track, new ECM map, new piston, new exhaust system (seven-pounds lighter), new exhaust temp sensor, new steering support, revised PTO engine plate assembly, improved oil line routing, new handlebar and handlebar grips, and new bottom brake disc protector. 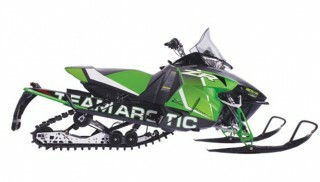 Arctic Cat snocross racers also get an updated sled for 2016, which boasts a ProCross design with improved rear spar tunnel mounting brackets, reinforced foot pocket, and optional X-32 brake mounting features. Other updates for the 2016 ZR 6000 X SX include new track (129x15x1.75), new brake caliper and pads, FOX 1.5 Zero C Center Track Shock, Borg Warner chain and sprockets, new rear suspension rail cap, new torque sensing link arm, new style retaining nuts, new steering support, revised driven clutch belt tensioner, revised PTO engine plate assembly and mount orientation, new resonator outlet seal, new exhaust temp sensor, and revised chain case mounting and fasteners. 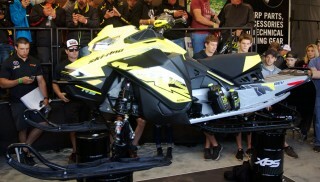 Arctic Cat also unveiled a new rear arm adjust “Hole Shot” device for improved starting line traction and performance. According to Cat, users can collapse the rear idler arm by applying pressure to the back of the snowmobile. 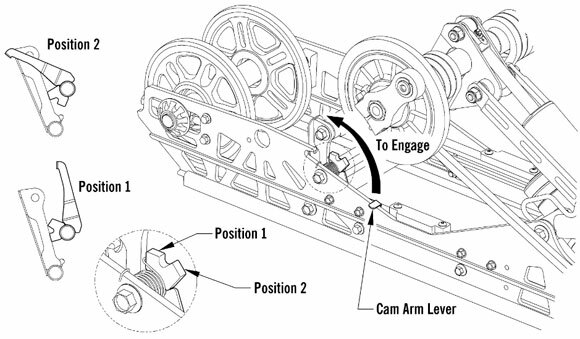 When the arm is pivoted towards the rear, you can rotate the cam arm to the desired position.